If you’re a physician, or perhaps even a patient, you may have seen white papers produced by manufacturers of amniotic or umbilical cord tissues claiming their product has millions of live stem cells per vial. Yet, as a physician who has pioneered orthopedic stem cell therapies and been involved in the basic science of stem cells for almost 15 years now, I can tell you that these manufacturers or vendors aren’t producing nearly enough, or even accurate, data to actually back their claims. In other words, their white papers don’t support their conclusion that these products have millions of live stem cells. You don’t even need to take my word for it. You can learn this information yourself simply by reviewing the FACT guidelines. And you can avoid amniotic and cord blood stem cell scams by applying the mnemonic FAD. Let me first explain the FACT guidelines. The manufacturers’ white papers love to tout viability testing, but the interesting thing is, these simple live/dead stain viability tests aren’t a metric in the FACT guidelines. Using the FACT guidelines, let’s review how you can avoid amniotic and cord stem cell scams by applying the FAD mnemonic. FAD stands for Flow, Adhere, and Differentiate. 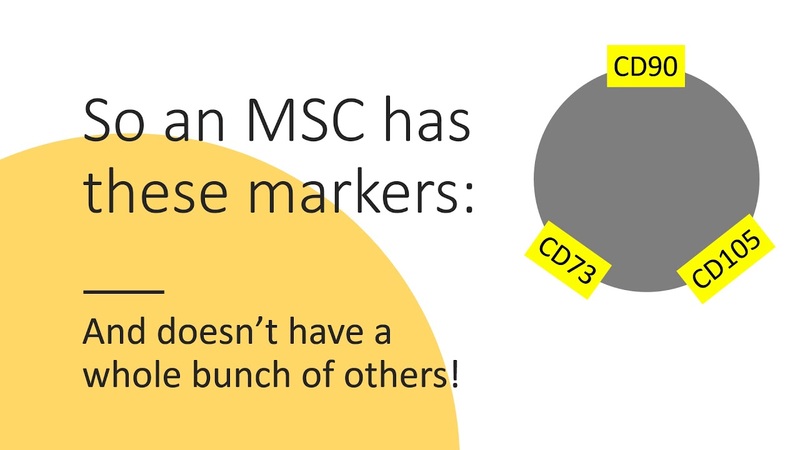 Remembering this mnemonic will make it easier for you to focus on what is important when identifying MSCs in a sample and avoid amniotic and cord blood stem cell scams. Let take a look at each of these metrics in more detail. Flow cytometry works by passing each cell under a LASER light source. The cells have already been exposed to a fluorescent stain that only adheres to one specific surface marker. Hence a cell with this marker fluoresces and this event is recorded by a computer. This is significant because every amniotic or cord blood company white paper that I have seen doesn’t test this full panel of cell markers. 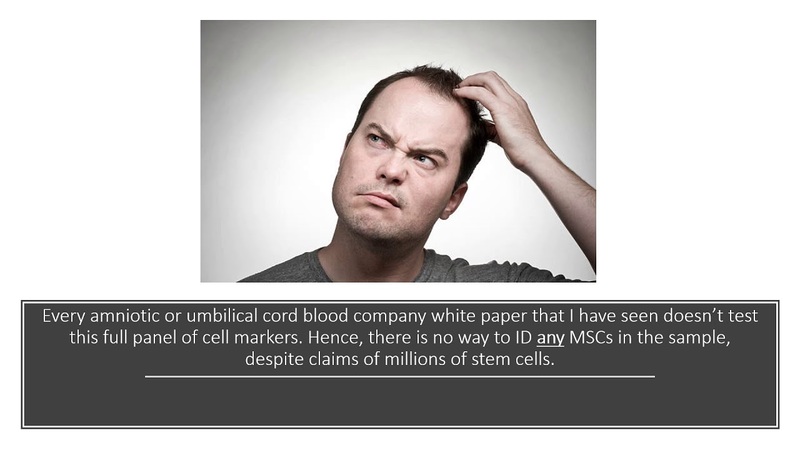 Hence, there is no way to ID any MSCs in the sample, despite claims of millions of stem cells. Hence, the conclusions of these reports is not supported by the data. MSCs like to adhere to plastic in culture; most other cells don’t have quite the same ability to latch on and adhere to a surface. A key part of identifying MSCs is to put samples in culture for about a week to see if they form colonies, or colony forming units (CFUs). Be sure to watch my video above as there are some eye-opening images of how a real MSC culture should look when it forms stem cell colonies compared directly to an image that an umbilical cord tissue vendor claims is a stem cell colony. Spoiler alert: there is absolutely no comparison between the two—a single bone marrow CFU contains thousands of cells, while a amniotic or cord stem cell product might have tens of cells. Real MSCs can differentiate into many different cell types in culture which include: osteoblasts (bone cells), adipocytes (fat cells), and chondrocytes (cartilage cells). So a test needs to be performed that shows that after adding the right chemicals to push the cells in one direction or another, you can stain for the presence of bone, fat, and cartilage in order to say that you’ve got stem cells. Despite the fact that this is a FACT guideline, I have yet to see a single company white paper include trilineage differentiation in their tests. The upshot? Using the FAD mnemonic will help you remember the FACT guidelines for identifying stem cells. Now that you know what to look for, the next time you talk with a sales rep or a doctor, claiming they can sell you or that they have live stem cells in a vial to inject, ask them to show you the FAD findings on that product: flow cytometry, plastic adherence, and trilineage differentiation. The silence will likely be deafening! IS IT POSSIBLE TO RECEIVE A COPY OF YOUR NEWSLETTER ABOUT PRP PROCEDURE? In 2011 whenever I was making any overhead movement, my shoulder was dislocating So I underwent my 1st surgery in April 2012 where he stitched up my shoulder joint. One year went by but there was no improvement in my shoulder condition so I took MRI scan. In MRI scan it showed pus in my shoulder joint. So I underwent another surgery which was done by Dr. Dinshaw Pardiwala in April 2015 where he cut opened my shoulder & cleaned that pus.He said it's a total shoulder cartilage loss. Now stitches from the 1st surgery started to come out. So is there any way to regenerate shoulder cartilage & what would it cost? It sounds like the lack of cartilage is the least of your shoulder problems. If you have a recent MRI and you'd like us to take a look to see if we can help, please submit the Candidate form, or call 866 864 9919.